Little Monkey Apps MAB Subtraction builds on the previous Apps, Little Monkey Apps MAB Addition and Little Monkey Apps MAB. This App compliments the use of hands on experiences for modelling subtraction problems using MAB blocks in instances when using real blocks is not practical. Depending on which school, educational system, state or country you belong to MAB blocks or base ten blocks have various names. 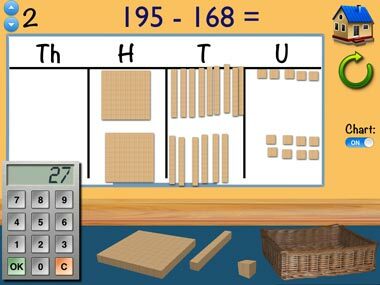 MAB or Multibase Arithmetic Blocks are wooden blocks used to help children understand the base ten properties of the numerical system in particular regrouping from one place value column to another. MAB aids students to physically move the blocks to demonstrate their understanding of addition to 9999. Contains place value chart, units, longs, flats and blocks, basket for trading and regrouping, random number generator, counter and camera feature. This module is for teachers to create their own learning experiences or for students to use when solving written problems, instead of using real wooden MAB. Students place 'ten' objects in the basket to 'make' or one object to 'break'. 'Make' label appears when ten objects have been placed in the basket and 'Break' label when one object is placed in the basket. This game addresses the need to teach and learn how to rename blocks. That is, 2 tens and 3 ones (23) is equal to 1 ten and 13 ones (also 23!) This skill is important in knowing why renaming can be used, rather than just knowing the how of renaming. 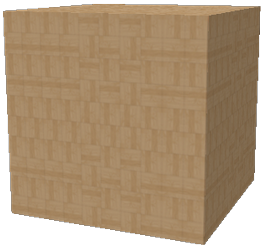 Blocks are set out on the floor, each question will dictate what type of renaming is to be completed. 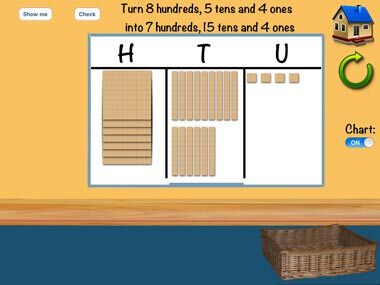 Use the basket to rename, then place the blocks on the place value chart. Place check to answer. If you want to be shown how to rename, press the show me button for a demonstration. 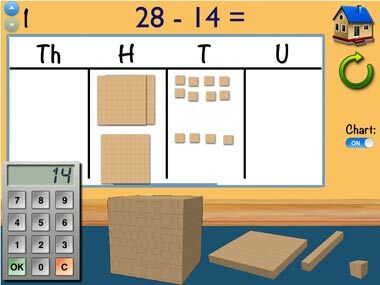 Use the MAB blocks to complete the subtraction problem, placing the higher number on the place value chart and moving away the blocks to the bottom section of the place value chart, counting what remains, then typing the answer on the keypad. Levels of difficulty can be changed the up and down arrow buttons. No regrouping required in this activity as a precursor to the following task. 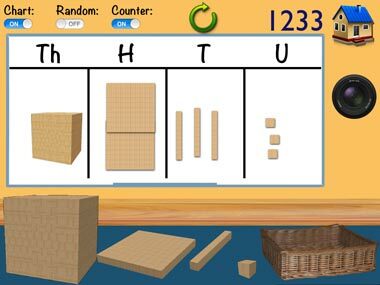 Use the MAB blocks to complete the subtraction problem, placing the higher number on the place value chart, moving blocks to subtract the lower value, use the basket to change blocks to rename to the required place value, then type the answer on the keypad. Levels of difficulty can be changed the up and down arrow buttons. Task appears similar to previous challenge but with renaming in all levels.